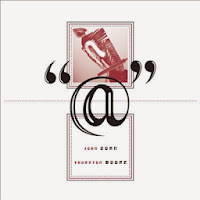 It is strange to write a review on an album by John Zorn and Thurston Moore shortly after Lou Reed has passed away*, all the more because the opening chord of “Jazz Laundromat”, the second track on this album, reminds me of “Venus in Furs”, my favorite Velvet Underground song. 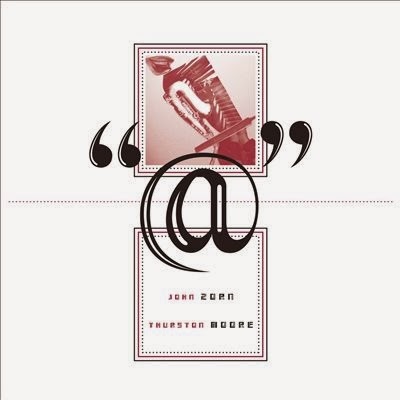 In general, the music of Velvet Underground, John Zorn (particularly Naked City) and Sonic Youth has always been like a New York soundtrack for me, and when I heard that Zorn and Moore planned to release an album I was really excited. "@" actually is the first album of these two prominent figures of New York’s downtown scene, it’s a studio recording of duo improvisations - and let’s be frank: it is absolutely fantastic. The album is bookended by two excellent pieces: “6th Floor Walk-up Waiting”, a twelve-minute-monster, which starts with Moore’s heavy, fragmented guitar explosions and Zorn’s typical angry saxophone screeches. It’s an emotional and musical rollercoaster ride in which both accelerate and slow down their intensity again and again. After a lot of feedback and guitar staccato hammering Zorn makes a U-turn and plays incredibly beautiful lines, as if another musician had joined the duo. Moore follows him with reverberating chords, creating an electrified wall of sound. The last track, “For Derek and Evan”, on which both actually pay tribute to Derek Bailey and Evan Parker, maybe the most legendary guitar-sax duo in free jazz (interestingly enough Zorn worked with Bailey** and William Parker on the marvelous “Harras” album and Moore with Evan Parker and Walter Prati on “The Promise”), is equally great. At the beginning Zorn refers to Parker’s extensive techniques and Moore to Bailey’s flageolets before they slightly shift the piece with guitar tremolos and saxophone shrieks so that it becomes their own track. In between – almost hidden – there are two more gems: “Her Sheets” is a real ballad with Zorn playing cool jazz lines while Moore delivers the edgy background. It is music for a New York film noir that takes place at 5 a.m. and in which the camera follows an exhausted protagonist walking through a deserted Lower East Side. “Strange Neighbor” also has balladesque moments but Moore’s guitar sound rather reminds of scratches, creepy cawing, drilling or distant howling, which creates a Kafkaesque atmosphere. I guess Lou Reed would have liked this music if he had heard it, its abrasiveness, its harshness, its elegance, its sound, its diversity, its beauty (including the fact that it makes you feel uncomfortable sometimes) and because it is on the threshold of pain sometimes. He would have played it loud so that every tone could cut like a knife through flesh. * John Zorn has worked with Reed before and has expressed his grief via facebook. **Zorn also worked with Bailey on “Yankees” (with George Lewis) and on “Improvised Music 1981” (with Laswell, Frith, Sharrock, Noyes) and “Company 91”. The album is just great, amazing indeed.